In the informative, entertaining, and generously illustrated Spartak Moscow, a book that will be cheered by soccer fans worldwide, Robert Edelman finds in the stands and on the pitch keys to understanding everyday life under Stalin, Khrushchev, and their successors. Millions attended matches and obsessed about their favorite club, and their rowdiness on game day stood out as a moment of relative freedom in a society that championed conformity. This was particularly the case for the supporters of Spartak, which emerged from the rough proletarian Presnia district of Moscow and spent much of its history in fierce rivalry with Dinamo, the team of the secret police. To cheer for Spartak, Edelman shows, was a small and safe way of saying "no" to the fears and absurdities of high Stalinism; to understand Spartak is to understand how soccer explains Soviet life. Champions of the Soviet Elite League twelve times and eleven-time winner of the USSR Cup, Spartak was founded and led for seven decades by the four Starostin brothers, the most visible of whom were Nikolai and Andrei. Brilliant players turned skilled entrepreneurs, they were flexible enough to constantly change their business model to accommodate the dramatic shifts in Soviet policy. Whether because of their own financial wheeling and dealing or Spartak's too frequent success against state-sponsored teams, they were arrested in 1942 and spent twelve years in the gulag. Instead of facing hard labor and likely death, they were spared the harshness of their places of exile when they were asked by local camp commandants to coach the prisoners' football teams. Returning from the camps after Stalin's death, they took back the reins of a club whose mystique as the "people's team" was only enhanced by its status as a victim of Stalinist tyranny. Edelman covers the team from its days on the wild fields of prerevolutionary Russia through the post-Soviet period. Given its history, it was hardly surprising that Spartak adjusted quickly to the new, capitalist world of postsocialist Russia, going on to win the championship of the Russian Premier League nine times, the Russian Cup three times, and the CIS Commonwealth of Independent States Cup six times. 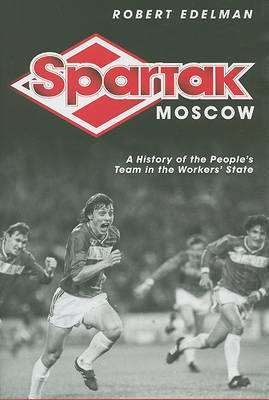 In addition to providing a fresh and authoritative history of Soviet society as seen through its obsession with the world's most popular sport, Edelman, a well-known sports commentator, also provides biographies of Spartak's leading players over the course of a century and riveting play-by-play accounts of Spartak's most important matches-including such highlights as the day in 1989 when Spartak last won the Soviet Elite League on a Valery Shmarov free kick at the ninety-second minute. Throughout, he palpably evokes what it was like to cheer for the "Red and White."